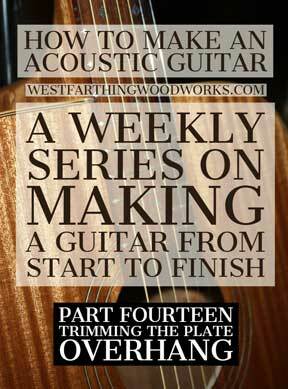 This is How to Make an Acoustic Guitar – Part 14 – Trimming the Plate Overhang. In this part of the series I will show you how to trim the plates flush to the body, which will prepare it for receiving the rabbet ledges for the binding and purfling. Enjoy. Now that the acoustic guitar body has been sealed, and the glue between the plates have had plenty of time to fully dry, it’s time to take the next step and trim the plate overhang. This is a fun step, just like the last few have been. 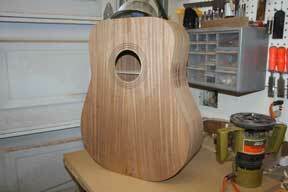 Right now the guitar body is stuck in the mold, and the two plates on the top and the bottom are well glued in place. 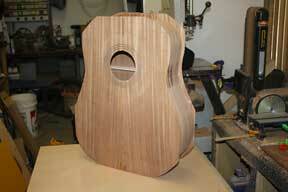 Your project is starting to look a lot more like a guitar, and it’s really exciting from here on out. 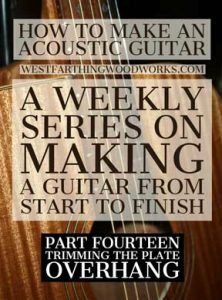 Is this part of the series, I’ll show you how to remove the guitar from the mold and trim the plate overhang on both the top and the back so it’s flush to the sides. This is a fairly easy process, and you can do it in a number of different ways, which I’ll show you. Stick around to the end and you see the mahogany guitar transform from something that has a lot of excess wood on the plates to something that more closely resembles an actual guitar body. If you are using an outside mold that hinges on one side, you’ll notice that you can’t just open the hasp and get your guitar out. This was actually pretty comical when it happened to me the first time, because I didn’t even see it coming. What happens when you try to open up the mold is that it tries to push the bottom of the guitar upwards faster than it can get past the top edges of the mold. This means you can’t open the mold at all, at least not without crushing your guitar. There are a couple of different ways around this, and one of them can simply be in the design of your body mold. Many of these open at both ends, which lets you separate the mold into halves. 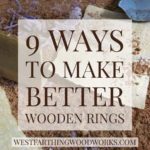 If your mold has a hinge on one side, you’ll need to work differently. For the hinged model, if the plate is small enough to pass through, you can unbuckle the mold and wiggle the guitar body out. If it doesn’t want to come out, just unscrew the hinge and the mold will separate into two pieces. 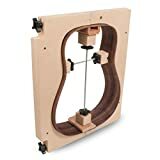 You can also replace your hinge with a hasp at that point, and you’ll have no problem removing your guitar body from the mold on the next round. Either way you go, just be careful getting it out. At this point in the process it’s time to inspect the acoustic guitar body to see if everything went well in the gluing process. 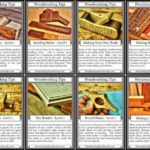 You’re going to spend a lot of time inspecting your pieces, but it’s better to fix anything now than to wait until it’s much more difficult. The biggest thing that you’re looking for at this point is that the glue joint is well formed, and strong. Make sure that there are no big gaps that can’t be covered by a binding strip, and that there isn’t any obvious separation that looks weak. Your guitar body should have not changed shape, and the general relationship between the sides and the top should still be 90 degrees. It should also be fairly similar on the back, except where the plate tapers down to meet the shoulders. If you find anything that needs to be fixed, go ahead and fix it. Again, it’s much easier to do this now when there aren’t more pieces attached to the body. Now that the inspection process is complete, and any issues of been addressed, it’s time to remove the majority of the excess plate overhang. Depending on how much you left behind when you attached the plates, you might need to start with the saw. In general, if you have more than an inch of material or so on the overhanging portion of each plate, it’s good to just start with a saw and quickly remove the majority. You can use a band saw or a coping saw, just be careful not to pull too hard. The point of the saw is to remove the excess material and give you a head start on the process. If you are too fast or sloppy, you could end up cracking the plates on the grain lines and actually making the guitar worse. 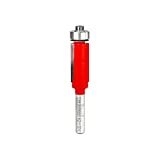 After you remove the bulk, or if you’re in a situation where you don’t really have that much to remove, it’s time to break out the chisel. This is the hand method for trimming the plate overhang back to the same level as the sides. If you’re looking for the power method, skip ahead two sections. 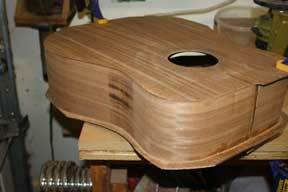 However, many a great guitar maker has trimmed their plates with a chisel, and you can do the same thing. Follow your grain so that way you are never cutting against it, and start trimming in thin slices. It’s much better to take thin passes and remove small amounts of material with each stroke of the blade then it is to try to dig out a big chunk. You’ll make a lot less mistakes this way, and you don’t risk tearing off too much of your plate. Work in sections, and as you do you will notice how easy it is to remove material this way. Work with a very sharp chisel of course, and don’t be afraid to stop to hone the blade if it seems to lose its bite. 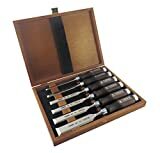 After you get very close with a chisel, you can switch to a sanding block or a cabinet scraper to finish the job. If you’ve gotten very close, you won’t need to move much farther to get the two surfaces completely flush to one another. For this job, the cabinet scraper is actually the easier of the two methods. Not only does it remove material a lot faster than a sanding block, it cuts the material in a way that squares the edges really well too. If you’ve never used a cabinet scraper before, it’s easier than you think. Buy a nice scraper and invest in a good burnisher. 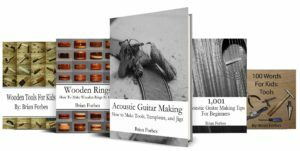 Learn to use them, and you will end up using this method for many different processes on your acoustic guitar. I promise. Whatever method you choose, keep on working around the guitar until everything is flush with the sides and both plates. Have some patience, and work in sections until you’re finished. The super fast method of trimming the plate overhang is by using a router and a flush cutting bit. This is the way that I trim my plate overhang, and it’s easily the fastest and the cleanest method. All you need to make this work as a router, and a flush cutting bit with a bearing on the bottom. The bearing will ride along the sides, and the cutter on the top will match the plates to the profile of the sides. The only areas that you have to pay attention to is where the bearing on the router bit will travel as you make the cut. Make sure that there are no dents or gaps for the bit to fall into, otherwise these will be copied to your plate edges. 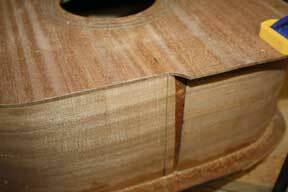 This is the most common at the head and tail block sections, because this is where the two guitar sides meet. It’s not uncommon that there be a tiny dimple between the two pieces of wood, and that dimple will be transferred directly to the top and back plate. 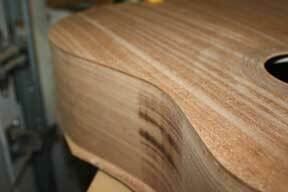 There is one area of the guitar body that is very difficult to get close too and that’s because of the size of your router plate. 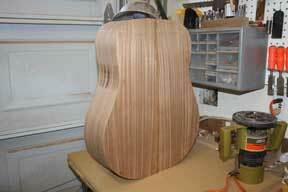 The tapered end on the back plate near the shoulders can be a little problematic for the flush cutting bit. One thing you can do is extend the length of bit that is exposed, and that will help you get a little tighter cut. 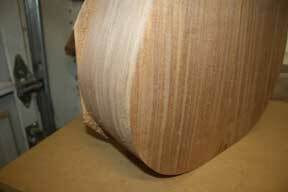 The other thing you can do is change out your router base for one that is smaller, or one that is cut off on one end. 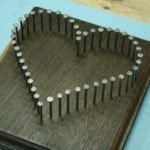 You can make a router plate like this simply by cutting straight across just outside of the screw openings to preserve them. Now, this very tiny portion of the plate is the only part that rides along the top of the guitar. If you don’t want to destroy a router plate then just switch to a scraper or a sanding block and finish that section of the shoulders by hand. One thing that you really need to do before you start cutting your rabbits is to make sure that the body is sanded really square. On the top plate this is very easy because it’s a 90 degree joint all the way around. On the back plate, it’s a little more involved. You need to make it as easy as possible to route the ledges. So, make sure that there aren’t any odd looking or pointy joints between the top plate and the sides. 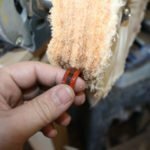 If there are, use a cabinet scraper or a sanding block to get them as even as possible. 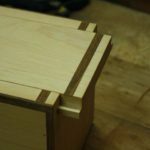 The more work you do at this point, the less you’ll have to when it comes time to route the ledges and install your binding strips. That part of the process is a bit more hectic, so do everything you can now to make it easier. 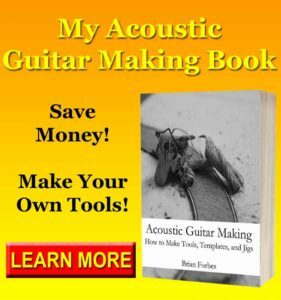 Next week, I’ll show you the process for routing the different ledges on the acoustic guitar to make room for your binding and purfling strips. These are the decorative strips that go around the rim of the guitar on the front and back. It’s a pretty easy process, and I’ll show you a couple of different ways to do it. The power method is of course the faster and easier method, but you can do the process by hand if you like. If you have any questions on trimming the top and back plate flush to the sides on your acoustic guitar body, please leave a comment and I’ll be glad to answer them. Happy building.